Within hours, President Obama takes to the microphones to furiously denounce the NRA and its ilk for resisting “commonsense gun-safety laws.” His harangue is totally sincere, totally knee-jerk, and totally pointless. …Nor does Obama propose any legislation. He knows none would pass. But the deeper truth is that it would have made no difference. …notice, by the way, how “gun control” has been cleverly rechristened “commonsense gun-safety laws,” as if we’re talking about accident proofing. I’m not someone can be simultaneously sincere and evasive, but let’s set that aside. Dr. Krauthammer explains that Obama engages in empty rhetoric because his real goal is truly radical and impractical. the only measure that might actually prevent mass killings has absolutely no chance of ever being enacted. …As for the only remotely plausible solution, Obama dare not speak its name. He made an oblique reference to Australia, never mentioning that its gun-control innovation was confiscation… Obama can very well say what he wants. If he believes in Australian-style confiscation — i.e., abolishing the Second Amendment — why not spell it out? Until he does, he should stop demonizing people for not doing what he won’t even propose. So why doesn’t the President say what he believes? I’m not sure what motivates the President, but this very clever video from Reason TV shows what would be needed to confiscate guns. As we’ve come to expect from the folks at Reason, an excellent job of combining humor and reality. Sort of a mix of this satirical video and this fact-based video. By the way, since many statists think Australia is a role model for gun confiscation. let’s take a closer look at that issue. Here are two charts from the guys at Powerline Blog. 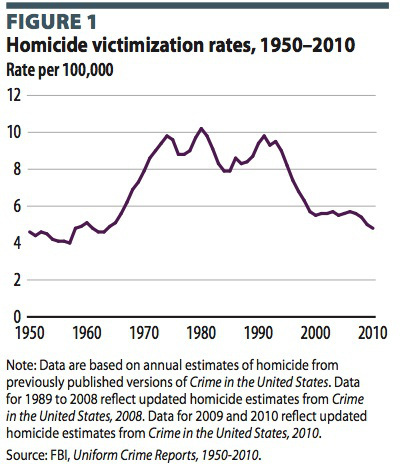 The first chart shows the big drop in murder rates in the United States during a period when gun ownership was increasing and citizens enjoyed greater freedoms such as concealed carry. 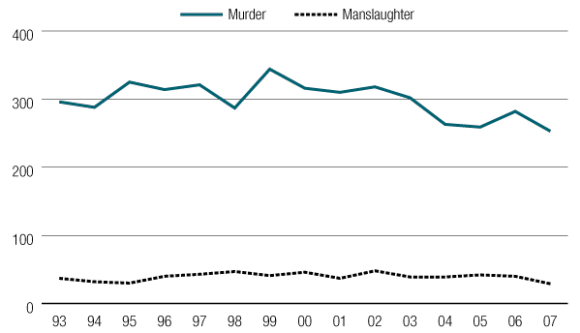 Now look at the data on the murder rate in Australia, with special attention to the change (actually lack of change) following the 1996 gun ban. John Hinderaker helpfully explains what is shown in these charts. There are lots of factors that determine gun violence, of course, so I’m not hopeful many statists will be convinced by John’s comparison. But I do hope that this evidence, when combined with all the other research on gun ownership and crime, may lead more middle-of-the-road people to the right conclusions. In the meantime, our leftist friends can rely on their version of social science research. I am generally sympathetic to your thesis, but the charts you are using to support your position are so dishonest I am left baffled. The hash marks on the y axis for the US was 2 deaths per 100,000, in which it was easy to see the decrease of about 5 deaths per 100,000, over a period of about 20 years (1990-2010). It looks very dramatic. Is 1990-2010 the period when ” gun ownership was increasing and citizens enjoyed greater freedoms such as concealed carry”? You don’t say, and neither do your links. Or was the period when ” gun ownership was increasing and citizens enjoyed greater freedoms such as concealed carry” over the longer period 1950-2010? In that case, there was no decrease at all. But, lets give you the benefit of the doubt and assume that the period you are really referring to is 1990-2010. Then I turn to the chart about Australia: in your y axis for Australia the hash mark 100 deaths per 100,000, ie, a scale is 50x the scale of the US chart. Did the gun deaths decreased by about 6 deaths per 100,000, over the time period we are talking about in Australia too? Who can tell? Can you eye ball 6 out of 100? And your scales on the x axis are widely different too: in the chart of the US, each hash mark is a decade, but the whole chart of Australia only covers 15 years. So the change, if there was any, is going to look far less dramatic. If you had compared the two sets of data on similar scales, your readers would have been, possibly, been able to do an honest compare of the two policies. Especially if you had actually specified when the gun ownership change began happening in the US. Instead you provided charts that seem to be designed to obscure the facts, whatever they are. I am sorry to say the only data I came away with was a sincere doubt as to your basic honesty. Common sense is something that some people do not seem to grasp. Obama’s version of “common sense” gun laws in confiscation; nothing less. From an email I recently received: Australia law to surrender 640,381 personal firearms to be destroyed cost more than $500 million dollars.